Mongoose Junction is the premier place to go shopping on St. John. The beautiful, historic architecture and local galleries, restaurants, and stores within the shopping center are all reasons to visit. During your stay with CimmaronStJohn, find some truly one-of-a-kind souvenirs and gifts to bring back home at Mongoose Junction. You might find some great outfits to wear during vacation or island art to hang up back at your house. There are plenty of other trinkets and artistic creations to pack in your suitcase and keep as memories. You will also discover some delicious food at Mongoose Junction. Choose from a variety of eateries to crave your shop ‘til you drop hunger. Also, be sure to visit Mongoose Junction around the holidays, when they offer some fantastic, fun events! Find out more about all of the great shops, restaurants, and galleries near your CimmaronStJohn vacation rental when you read our St. John attractions guide. It’s full of the best recommendations for things to see and do like enjoying a day at Mongoose Junction. The design of this beautiful shopping center was inspired by the Danish plantations of the 1800s. It incorporates local stone, brick, and coral and has a stunning landscape of lush, tropical plants. The stone and mahogany facade is a wonderful artistic setting for a wide range of shops and galleries. Discover unique island finds amid the gorgeous open-air courtyards, and feel as though you are taking a step back in time as you wander the buildings. When you go shopping at Mongoose Junction, you will discover a variety of local stores for your souvenirs and gifts. Find T-shirts and surfwear at Big Planet or find a perfect Caribbean-inspired date night outfit at Bamboula. Browse Bajo El Sol or Caravan Gallery for some local artwork or stock up on keepsakes at Sugar Birds or Nest & Co. Get great glassware, tumblers, and koozies at St. John Brewers Brewtique. And top it all off with some hand-crafted jewelry at R&I Patton Goldsmithing. There are some delectable options for dining at Mongoose Junction. Enjoy great frozen drinks, smoothies, and St. John cocktails at the Gecko Gazebo Bar. Grab a sandwich made with slow-roasted meat for lunch at the North Shore Deli. Lounge in the spacious courtyard at Sun Dog Cafe, or enjoy a romantic, contemporary meal at Ocean Grill. Viva La Revolution Cantina brings a fresh approach to Mexican Dining, while The Tap Room serves locally brewed beers and sodas for a cool refreshment. Top off your meal with some homemade ice cream from St. John Scoops! The holidays are a wonderful occasion to celebrate, and we love to celebrate here on St. John! At Mongoose Junction, you will discover some great festivities. You can trick-or-treat here on Halloween each year to stock up on candy. You can also enjoy some Christmas festivities. All are welcome to attend the Mongoose Junction All-Island Holiday Party that we locals like to call “The Prom.” This December gala features a night of drinking, laughing, and dancing to live reggae music in our “winter” weather. 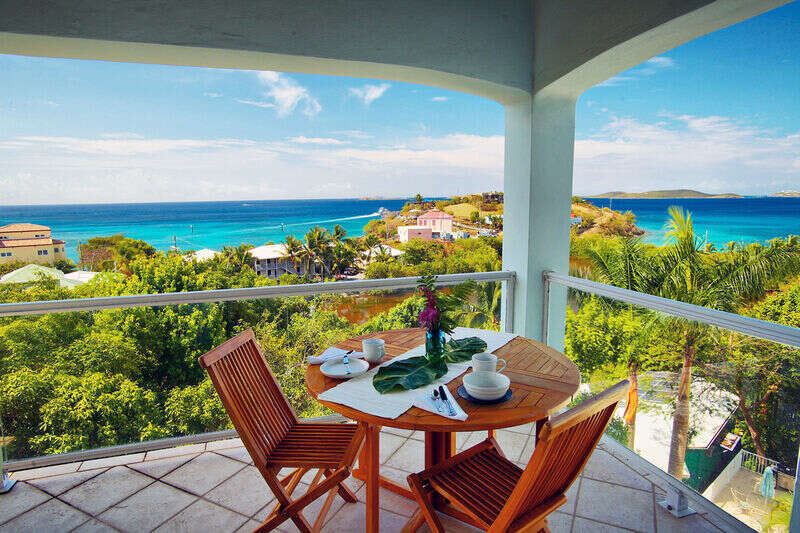 Our private luxury vacation homes make great getaways on St. John. Escape the cold weather or revel in the heat of summer with a visit to our gorgeous island. We want you to experience our little slice of paradise!